Yeaaaaaaaaaaaah!!! full support !!!! See u in the show! Full length previews are up on Soundcloud and LastFM and on LastFM you can also download the tracks. Our new motto is "try before you buy" ...anyone who would buy music understands the difference between WAV quality and 128 kbps. Every sale really helps keep the music alive and flowing, so all you folks who wanna show your support, just a reminder that you can buy through distribution (Beatspace, etc) to get good shipping costs, especially with multiple CD orders. But you can also buy from us direct, either through our webshop if you wanna pay by credit card or contact me directly if you use Paypal or are in the EU for a free bank wire transfer. Anyone who contacts me directly for an order will get a great price and friendly customer service. Happy Listening to the Triplag show SAt night - we are hoping to hear some of it! Big thanks AGAIN to Vic, oh Captain, our Captain! one more SUPER KILLER release by Lycantrop..!!!! 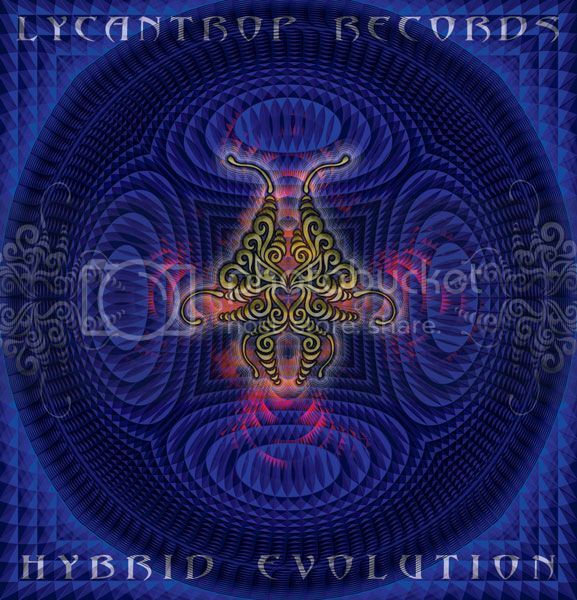 and all the full tracks i listened in Last.fm by Hybrid Evolution just amazing.!!! best wishes and best of luck with this bomb Keira and Nelson,my Lycans friends you ROCKS.!!!!! can't wait for my copy.!!! HYBRID EVOLUTION CD will be officially released tomorrow (Beatspace, Psyshop, Goastore and more will come soon). Digital distribution coming soon. The last Original Version Lycantrop Tshirts are only available in size M and L. Get one with your CD order for just 20 € including shipping. Thanks for keeping the vibe alive! Auwooooooh! My next dj set will be specially dedicate to all Lycantrop crew!! Keep cooking "Psygourmet" trance music Lycantrop!! Tks for listening! Looking forward to the Lycan set!